Le dernier film de surf de la marque Quiksilver vient de sortir. Il est consacré à la vie du jeune prodige de 19 ans : Clay Marzo. Ce surfeur est atteint d’un syndrome d’Asperger, considéré comme une forme atténuée d’autisme. Cette vidéo est un concentré de figures radicales : tubes bien profonds, cut back ravageurs, tails slides, rollers avec les 3 (et parfois quatre ! ) dérives dehors… Tout le répertoire du surf moderne y passe ! Le tout avec des sous-titrages en français, anglais, espagnol et allemand; ce qui est presque un luxe pour un film de surf ! Occy : Far out, I love Clay’s surfing, it’s amazing. Dane Reynolds : Oh in terms of ability, he’s at the top. No doubt. Kelly Slater : Probably no one at 18, at his age, in the world right now that does as big stuff as he does. Andy Irons : As far as 18 years old goes, he’s the best in the world by far. C.J. Hobgood : It’s hard to know what’s going on in that kid’s head a lot of the times. A.I. : Yeah he starts doing this… I love that. (Note de Surf Prevention : Andy Irons précise sur la version intégrale de la vidéo que Clay Marzo adore faire cela quand il voit une vague et tout spécialement une gauche; Andy ajoute que lui aussi va se mettre à se frotter les mains frénétiquement avant de surfer…). Clay Marzo : Waves are…toys from God ! Dr Tony Attwood (Asperger’s Syndrome Expert) : Asperger’s is a form of autism, it’s what we call a higher form. Dr Chitra Bhakta (Autism specialist ) : they seem normal, but yet have enormous problems with social interaction. Dr Attwood : Some things are processed so superbly, the person has areas of excellence. Dr Bhakta : That one sphere of excellence that they have, that they can devote, I think, exceptionally long hours of concentration. Dr Attwood : You don’t suffer from Asperger’s, you suffer from other people. Clay Marzo : I like traveling, but like, I really don’t. C.J. Hobgood : You gotta be at the airport here, where’s your passport at ? Kelly Slater : I think he’s naturally gifted enough to make it on tour. Clay Marzo : I got a good wave, yeah ? Chad Wells (Surf Team Manager) : Just paddle in. All you need is a one something. Martin Potter: All right Clay, come on ! Aw he got swallowed. Damn. Clay Marzo :(Maui), rock island in the sun. Water mic footage: I got barreled ! 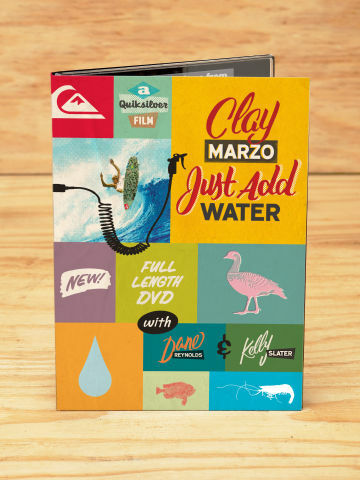 Partager la publication "Sortie du film Just Add Water en DVD"